The role of London and its economic role in the economy of the South East, as well as the wider UK, has been well discussed. From outlandish property price stories to worries about the “vacuum cleaner effect”, it is not hard to find column inches devoted to the Great Wen. Instead of speculation, better consult the evidence. The CBI’s London Business Survey was released yesterday, and shows that businesses in the capital are positive about the future: two-thirds of businesses are planning to expand their business over the next year. But the survey also shows that nearly half of businesses have a skills shortage among their current employees. Our UK Employer Skills Survey talked to over 10,000 businesses in the capital about just these issues. This large sample size lets us break the findings down into detailed borough-level information. With skills shortages seen as such a problem, what are London businesses doing about it? In 2013 64% of businesses in London trained their staff, which is slightly lower than the England average (66% of businesses in England carried out training). But when you break this down at borough level, it is clear that London business is not operating in a homogeneous way. 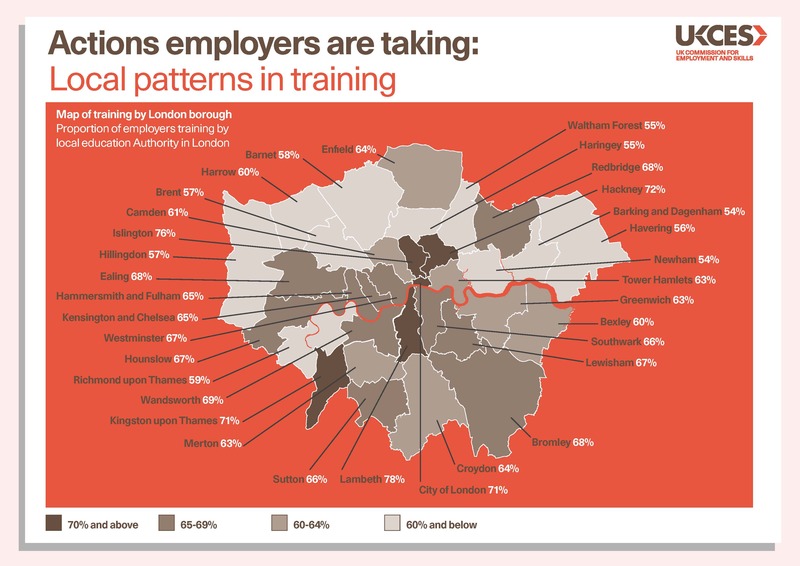 Training rates range from Lambeth where 78% of businesses trained, way ahead of the national average, to Barking and Dagenham, where 54% trained. It is encouraging that the CBI found that half of businesses have developed links with local schools or colleges. The fact that half of these firms said they provide work experience to students, and a further 37% offer careers advice and talks is welcome news – showing that interaction with students and education providers clearly gives employers a glimpse into just how vital it is for young people to gain experience. We have highlighted good practice in college and business collaboration, as well as showing how important the transition from education to employment is. Our work on the importance of building strong links between employers and colleges can be found here. Later this month we will also be launching a new report showing the benefits of links between universities and business. And we have already shown how these partnerships led to students working on the Oscar worthy special effects for Gravity. But despite all of this, the spectre of skills shortages still looms large. Our own research has shown that the number of cases where employers in London have been unable to fill a vacancy due to skills shortages has more than doubled since 2011 - rising from 14,000 to 30,000 in the capital. Such a rapid increase is concerning, and shows skills shortages run a real risk of inhibiting growth, acting as the unpleasant clump in the capital’s vacuum cleaner approach. It is therefore vital that employers maximise this opportunity to grow not just their business but also their people, investing in training and skills to smooth the path ahead. Whilst this growth is welcome it is vital employers take care to make provisions for the future. It is the green shoots, after all, which must be nurtured the most.